Yes, this is her racing name -Darkdeserthiway. She starts her new life with a new name of Minnie and now lives in Liberty Twp. Andrea and Ben have been long time members of GAGC and have fostered many dogs for us and supported our efforts for 13 years. 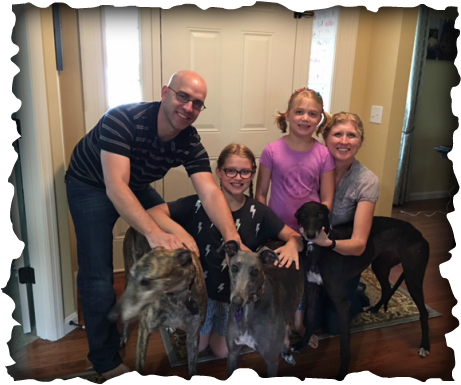 This little black foster girl decided she was already HOME, so Ben, Reese, Remy and Andrea made a decision to add the third greyhound and welcomed her into their family. Minnie does so well with the girls and brindle boy, Ricky and blue girl, Jax. The family cat was not available for the family photo, he also does well with Minnie!